More than 600 attacks on minority Muslims and Christians during the first 100 days of the new government led by Prime Minister Narendra Modi have prompted Christians and activists to set out a series of protests. At a September 2 meeting in New Delhi attended by over 50 Christian leaders, lawyers and social activists, several committees were set up to draw national attention to the “conspiracy” behind the sporadic violence. On September 4, the core committee announced plans to bring out a “Minority Report on 100 days of Modi Governance,” detailing atrocities during the first 100 days of the new government. 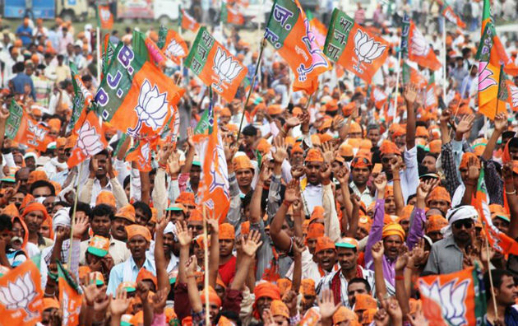 The government under the Bharatiya Janata Party, or BJP, known for espousing Hindu nationalism, assumed power on May 26 after its landslide victory in the election to choose India’s 16th Parliament. Apart from the report, the coalition of Christian groups and secular social networks have announced a convention on minority rights on October 2 – the national holiday marking the birth of Mahatma Gandhi. The convention will be followed two days later by a public protest in New Delhi. The plan followed the capital’s Christian leaders’ response to two recent and widely report incidents of anti-Christian violence from Uttar Pradesh state, bordering New Delhi. On August 27, a Seventh Day Adventist church in Asroi village in Aligarh district – 160 kilometres south-east of New Delhi – was ‘purified’ with a ritual and declared a temple by Hindu fundamentalists, after “re-converting” an extended family of Christian converts back to Hinduism. Hindu fundamentalist groups sent out photos and a press release to claim that 72 low-caste Christian converts had returned to Hinduism. “This is mere propaganda and a ploy to intimidate Christian congregations as a whole. Saffron (Hindu fundamentalist) groups are behind it,” Sundar Singh, a Dalit Christian activist who visited the village in a three-member fact finding team, reported at the September 2 meeting. The fact-finding team reported that the “purification” ritual and the “reconversion” of Christians had been held with more than a dozen members of an extended family. Since the pastor had made only irregular visits to the village, Hindu fundamentalists targeted them. “It was organised by Hindu fundamentalist outfits capitalising on the lapse of the pastor,” pointed out Catholic priest Dominic Emmanuel, a member of the fact-finding team. The ritual was photographed and video graphed and sent to the media with the claim of reconversion of 72 Christians besides uploading it even on YouTube. “But there are only five Christian families with 30 members in the area,” he added. In a memorandum to the chief minister of Uttar Pradesh state, the Christians have condemned the conversion of the church to a temple, urging him to intervene to protect their faith and their properties from the Hindu fundamentalists. “The series of atrocities did not end with Asroi. At Hasayn in the same district, the pracharaks (Hindu activists) wanted to conduct the same purification inside the church but were stopped by the police,” said Osmond Charles, an advocate. While the Christian delegation was in Aligarh on August 30, another shocking incident alarmed the Christian activists in the national capital: a dozen pastors were illegally detained by the police on false “converting Hindus to Christians” charges at Surajpur village near Noida, on the border of New Delhi. “With a crowd of protesters making a spectacle, police took into custody pastors from the regular prayer meeting. When seven others reached the police station, they were also detained. The police even beat some of the pastors to please the Hindu mob creating a violent scene outside the police station,” Singh said. “The police chief of the area even told us that ‘this is a Hindu nation.’ The police have changed colours with the change of government,” he said. While ten pastors were released late into the night, the remaining two were released only on the next day, despite Christian lawyers and leaders arguing with the police about the illegal detention. The police on September 1 conceded that they found that the allegations against the pastors were “baseless,” and that people were praying with the Christian pastors of their own volition. Dayal’s warning has been confirmed by a September 3rd incident at Shivpuri district in central Madhya Pradesh where four Dalits who converted to Islam were publicly subjected to “re-conversion” by leading Hindu fundamentalist groups. According to the Indian Express, half a dozen Dalits who had expressed willingness to embrace Islam were not spared, either. “Where is the freedom of religion guaranteed under the constitution?” asked Shabnam Hashmi, a prominent social activist at the September 2 meeting in New Delhi. Hashmi, founder director of ANHAD (Act Now for Harmony and Democracy), pointed out that more than 600 incidents of violence against minorities have been reported in less than 100 days of Modi’s government. “It is time for all to join hands and protest,” she urged. Rev. Richard Howell, general secretary of the Evangelical Fellowship of India told the meeting that EFI is documenting the atrocities against Christians.